Any eye examination is incomplete without a thorough examination of the retina, a piece of sensitive tissue that is at risk of developing a wide range of disorders that can lead to partial or complete loss of vision. Therefore, it is of paramount importance that retinal abnormalities are detected at the earliest possible so that they can be easily treated. 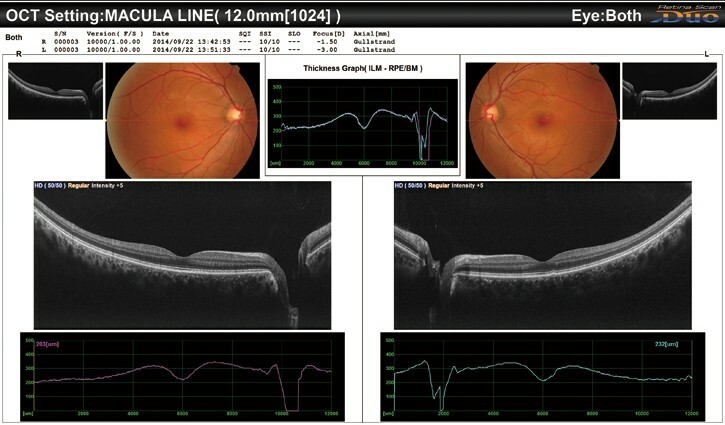 Digital retinal imaging is a modern sophisticated optometric technique in which high resolution digital photographs of the retina are taken in a bid to find out if the patient is in good health. The procedure is easy and painless and can help the eye care specialist find out for sure if you are at risk for or already suffering from disorders such as diabetes, hypertension, and macular degeneration, which can lead to permanent blindness if neglected. Digital retinal images give a comprehensive picture of your optic nerves, blood vessels, and retina. These records are to be saved and studied in comparison with images taken in future so that eye care specialists can assess changes if any. Digital retinal images provide a complete picture of the back of the eye, making it easier for ophthalmologists to detect eye problems and verify eye health condition before things get out of hand. Eye care specialists use this technique to detect common disorders such as glaucoma, cancer, diabetes, hypertension, and others at the earliest possible so that they can be treated early with minimum inconvenience to patients. • It gives doctors a larger view of the retina than other eye examination techniques provide. • It gives patients a permanent record that can be used in future too. Eye doctors are concerned about retinal tears or holes in the retina, retinal detachment, macular degeneration, and other retinal disorders. Moreover, signs of medical disorders such as diabetes, hypertension, arteriosclerosis, and others are first observed in the retina, leading to early diagnosis and treatment of these disorders. Since digital retinal images are permanent records, they can be studied in comparison with previous and future records to get a thorough idea of an individual’s retinal health. If the patient moves to a different geographic location, the records can be emailed or posted to the eye care specialist he/she consults. Optometrist has excellent digital retinal imaging equipment, which our certified eye care specialists use to provide you a comprehensive picture of your eye health. The doctor uses this equipment to take photographs of the back of your eyes so that problems, if any, can be detected at the earliest. If you are at risk for diabetes, nerve damage, and hypertension, we will be the first to detect it because signs of such disorders are first spotted in the retina. We will keep your records carefully, and whenever you come in for re-examinations, we will make comparative studies of the older and newer records to find out if your condition has improved or deteriorated.